You are currently browsing the category archive for the ‘beekeeping’ category. BCBA will be hosting a wooden ware workshop on Saturday, March 17th beginning at 9 am at the Masonic lodge in Alcoa (corner of Wright Road and Vose Street). This is an opportunity for anyone interested in putting their hives together with the help of some seasoned beekeepers. You will be shown the correct way to put together the hive bodies and frames, and will go over how to maintain your equipment. There is no charge for the class. It should end around lunch time. The Blount County Beekeepers Association will be offering an additional beekeeping class on March 10th at 9 am at Maryville Church of Christ. You must register for the class with Stacey Adair to receive class materials by March 1st. You may still come if not registered, however we may not have additional materials for you to take home. Please click on the download link below for more information, who to register with and address for the church. Hope to see everyone there! A reminder-Short Course next weekend! Pre-order your special HoneybeeTn license plate today! The State of Tennessee requires a minimum of 1,000 pre-orders to start the production process of the new plate. The Tennessee Department of Revenue estimates that after it receives the pre-orders, it will take 4-6 months for plates to arrive at local county clerk offices. Please join us for an informative course on how to get started in beekeeping. There is no charge to attend, and everyone is welcome! The meeting will take place at Maryville Church of Christ, 611 Sherwood Drive across from Shoney’s restaurant. Topics of discussion will include setting up an apiary, personal protective gear, when and where to get bees, and other important topics for beginning beekeepers. We will also have 3 beekeeping vendors at the meeting who will be happy to show you all the equipment you will need to get started. Contact information and other information is listed on the link to the flyer above. Hope to see you there! The Blount County Beekeepers Association is pleased to announce that they will be awarding 5 new beekeeper grants in conjunction with the Tennessee Beekeepers Association. Each recipient will receive a complete starter hive as well as a 3 pound package of bees. Each recipient will also be paired with a mentor for 2 years. There are specific requirements to make application for each grant. See the attachment for a copy of the grant cover letter and application. You must be a member of the Blount County Beekeepers to apply, and you must attend the short course for new beekeepers which is scheduled for February 17th. There is no fee to attend the short course, and the dues for BCBA are $20/year, individual or family. You must join TBA (Tennessee Beekeepers Association) in order to apply for their grant. Please download the application, fill it out, see Bernie to pay your dues, and have the application in by March 9th. The grants will be awarded at the March meeting. Please make plans to join us for the Christmas dinner on Monday, December 11th at 6:30 pm at St. Paul Lutheran Church in Maryville. We forego our usual itinerary to allow for time to visit with all our fellow members and enjoy good food and entertainment. The cost of the dinner will be $15 per person and may be paid to Bernie McGraw. You must reserve and prepay your dinner. The deadline to pay will be announced at the November meeting, but is usually about 2 weeks before the date. We hope to see each and every one of you on the 11th! For over 17 years, Jennifer Berry has been the Apicultural Research Professional and Lab Manager for the University of Georgia Honey Bee Program. Her research objectives have focused on queen breeding, keeping bees alive, the sub-lethal effects of pesticides on beneficial insects and IPM techniques for varroa and small hive beetle control. Jennifer’s extension duties include teaching beekeeping to people from all walks of life, including those in Central and South America, to those imprisoned in Georgia’s maximum security prisons. She is also passionate about educating the public about the importance of beneficial insects and is somewhat of a regular columnist for Bee Culture magazine. 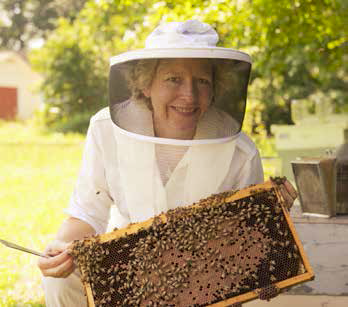 On weekends and nights she operates Honey Pond Farm, a honey bee venture that sells quality nucleus colonies and teaches how to raise superior queens at her farm in Georgia. Our next meeting on October 9th will be the annual auction to raise money for the new beekeeper grants awarded in the spring each year. The program was started years ago in memory of one of our outstanding members, Charles Stewart. The original grant was a cash award that the new beekeepers could use to purchase equipment to get started in beekeeping. It has evolved over the years to merge with TBA’s hive award program, so that we are able to award the hives plus packages of bees now to new beekeepers. The money raised from this auction is dedicated to new beekeepers start up kits only. It is not used for general operations for BCBA. BCBA takes all kinds of donated items including clean, new wooden ware, protective clothing, wax, tools etc. to be auctioned. You may also donate bee related items including clothing, bee nick knacks, ceramics, etc. We have had local artwork donated from our members including paintings, wood turned items, and hand crocheted items that have been true treasures to purchase. We do ask that you do not bring used wooden ware to the auction. So bring your items to donate and your check book to the meeting October 9th and plan to have some fun!